BlackBerry CEO John Chen says he's heard people "in the know" mention the year 2025 as the year fully autonomous vehicles arrive. TORONTO — BlackBerry Ltd.'s revenue and adjusted earnings came in above analyst estimates in its fourth quarter, as all three of the company's main software divisions, including automotive, showed growth. 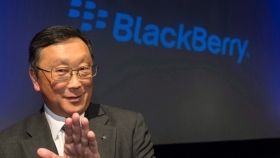 John Chen, who is BlackBerry's chief executive and executive chairman, said he was pleased with the company's progress since it decided to stop manufacturing smartphones. Chen noted that all three of its software divisions — focused on enterprise, intellectual property licensing and automotive markets grew in the fourth quarter, both year-over-year and quarter-over-quarter. "Our strategy is working," Chen said. For Chen, BlackBerry's future includes opportunities for securely connected devices, as its Radar hardware and service for the trucking industry, and for QNX software embedded in connected and autonomous vehicles. BlackBerry is primarily a software component supplier to Tier 1 automotive suppliers, including Canada's Magna International, but it's also working with Ford and, more recently Jaguar Land Rover, as they develop their vehicles. Chen said that he's heard, anecdotally, that the introduction of commercially available autonomous vehicles might come later than 2021, a publicly stated goal of BMW and Honda. He said he's heard people "in the know" mention the year 2025 more often recently at cocktail parties but described that as hearsay that would make a lot of sense. Last week's pedestrian fatality during a test of a Uber self-driving vehicle in a Phoenix suburb has sent shock waves through the industry and caused the ride-sharing company to suspend its on-road testing program, including in Toronto. Chen said BlackBerry isn't a supplier to Uber or to Google's Waymo automotive division but QNX continues to conduct off-road trials of its software, including a test-track run that's expected soon in Toronto. He said it will be at least a year before BlackBerry's ready to conduct an autonomous vehicle trial on public streets. Other current and future opportunities for the company include enterprise software and services that provide governments and regulated industries, such as banking, the tools to provide secure communication for their employees, partners and customers. Besides its traditional vertical market segments, BlackBerry is also seeing expanded opportunities within the hospital, pharmaceutical and energy vertical markets. It's also building its presence in China, Korea, and Japan, he said. BlackBerry's shares were little changed Thursday morning, trading at about $16. That's up nearly 70 per cent over the past year. Two weeks ago, the company announced a five-year contract extension for Chen, who has been executive chairman and chief executive since joining the company in November 2013 with a mandate to turn it around. Chen's new contract, which runs to November 2023, is weighted toward long-term performance-based equity and cash awards, in addition to a time-based equity award. His base salary, short-term cash incentive and benefits won't change.